Mosta is a town in the Northern Region of the Malta. It has a population of 20,241 (in 2014) and is one of the larger towns on the island. It sits roughly at the geographical centre of the Maltese Islands, making it a crossroads for people travelling from the south and east to the north. As such, a lot of traffic comes through its narrow streets. 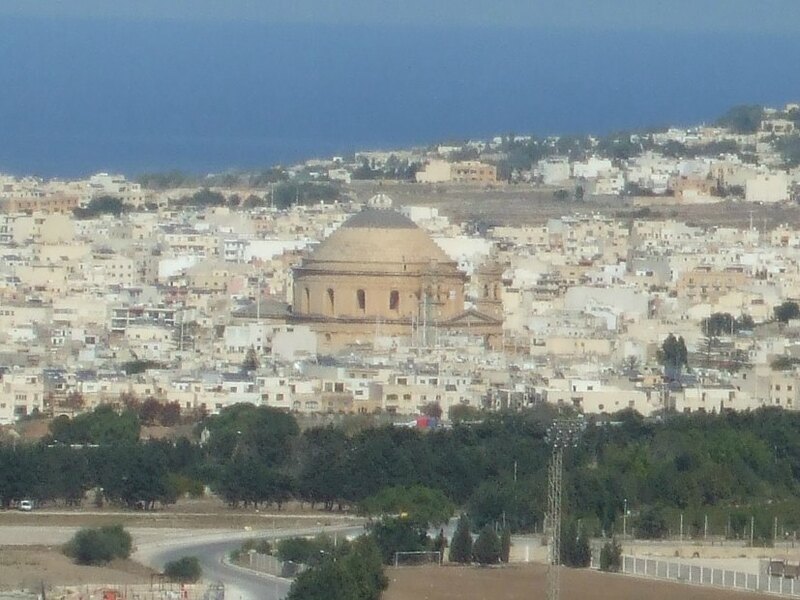 The image above, taken last year, shows a view of Mosta from Mdina, three miles away. 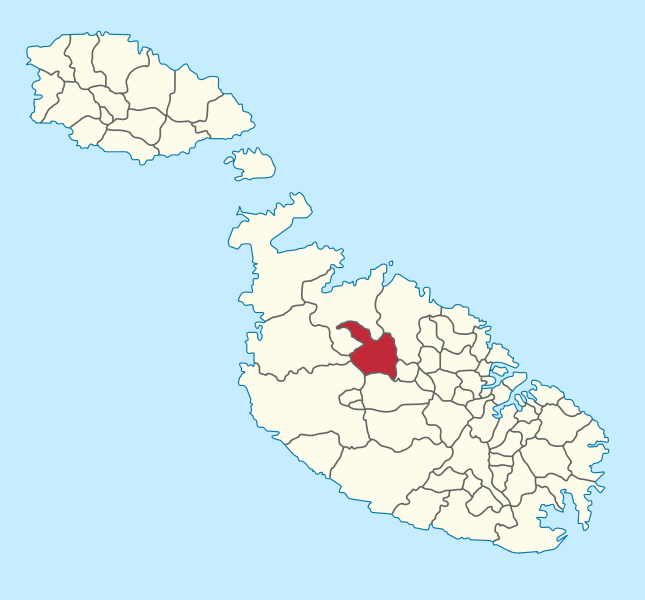 Location of local council XY (Mosta region) in Malta. Author TUBS. The remains of people who lived in the Mosta area date back to the Copper Age (4100-2500 BC). The actual name of ‘Mosta’ is of ancient origin – some claiming it to be linked with the legendary Atlantis. Other suggestions include ‘mysterious village’, the ‘hidden place’ and the more widely accepted ‘central place’, which is derived from the Arabic for ‘centre’. As a village, Mosta never stood much chance of development until the late 17th century. It was always too accessible to marauding pirates who could make their way from the sea along the Madliena Valley. The people’s only hope of defence was to make it to Mdina, three miles away, or to one of the stronly defended stone farmhouses – or to retreat behind the doors of their own church. In the 18th century, the Mostin (people in the Mosta area) decided that their own church was both inadequate for the population size -which had reached 3,000 by then – and structurally unsound. Eventually, between 1833 and 1860 a new church was built – using funds raised by the local people. It was formally blessed in February, 1860. The church was designed by French-born, Maltese architect Giorgio Grognet de Vasse, and was modelled on the Pantheon in Rome. Grognet reportedly tested slabs of rock from every quarry on the island before settling for the lovely, golden limestone from Ta’ Venezja quarry at Ta’Qali. It was built around the framework of the old church to allow people to continue attending mass. The huge, heavy limestone dome was built without the use of scaffolding – quite a feat – and the old church was only dismantled once the new one was complete. Other than the beautiful building, the thing that draws many tourists to the Mosta Dome is the story of an event that occurred on April 9th 1942, during the Siege of Malta in WW2. On that day, four German bombs hit the Rotunda. Three of these did not explode and one penetrated the dome and landed in the middle of the church. The reason for the bomb-drop is unknown; as a central village, Mosta is a long way from ports and airports and, until that day, hadn’t been a target for bombing. But the town was in the flight path of German bombers heading to or from the RAF base at Ta Qali – which could well explain the drop. None of the 3oo people present suffered any injury – and the Mostin see the reason as divine intervention. The bomb – a 500kg Luftwaffe high explosive – was defused by Royal Engineers Bomb Disposal Sections and, like all neutralised bombs on the island, was taken to the west coast to be dumped in the sea. It was one of the 7,000 bombs dealt with by R.E. Bomb Disposal Team in two years. Well, that’s it about the Mosta Dome. It’s well worth a visit should you go to the island . . . depending on your interests, of course. There are sites to suit all tastes on Malta, and I’ve still got a lot of them to see. Thank you Shivangi. It’s quite a stunning church inside, especially looking up at the dome. What a beautiful church! I especially like the dome, and I’m always a sucker for freestanding wooden pulpits. I didn’t realize that a church has to *become* a basilica by being approved by the pope, but your post inspired me to look that up. Interesting — I learn something new every time I read your blog, Millie! It will become a basilica this year, we were told, so that was new to me as well. It’s worth a visit, if you ever get to Malta. Apparently, the cathedral on Gozo claims that their dome is bigger. It seems it’s taller but it not as wide. And so the squabble continues. Thank you for reading, Joy. Wow what interesting history and facts about the church! Amazing that everyone was ok! The pictures are wonderful as usual! It would be a very interesting place to visit! The church is truly beautiful. And the story of the stray bomb that didn’t explode does fill you with awe. Thank you, Millie, for posting so many lovely photos of the interior. In some ways history can be a signpost to the future. We (meaning the human race) are where we are today because of what happened in the past. Yet I do believe that lessons are to be learned from history, and perhaps we can change things that are not good or beneficial to mankind. I certainly hope that’s so. Thanks for commenting, Imran. Thanks for the report, Millie. I do hope to see it one day. And how big is that bomb? It is a great story and incredible that it didn’t explode. Can you imagine the damage to people and the building itself? We, in Australia are so lucky not to have been touched too personally with the ugly and often horrendous side of political arguments and conflict/war. Britain was badly bombed, as you know. My mother’s family were in Liverpool, a port, and so many lost their homes and some their lives. My grandmother had a hat shop, of all things, which was bombed to the ground. Fortunately no one was in it at the time. That’s when they all moved to Southport up the coast, where I was born. My dad came from Southport. Yes, Australia was fortunate to have escaped bombing – although many Australian soldiers/pilots etc. lost their lives in the fighting. Wars are such dreadful things. Malta, especially Valletta, suffered far more bombing than anywhere else. It just went on and on for so long. Oh how dteadful, Millie. I can imagine how horrible and dark these memories are for your family and for the Maltese people. It would certainly haunt one in those nights when a person can’t sleep! Australia was bombed by the Japanese, late in the war but that was the only incident. The allies however retreated to my city and drew a line there across Australia. Thet were prepared to defend south of the line and ‘give away’ to the Japanese, the whole of the Northern half of Australia!! A concept whilst perhaps realistic, is mind-boggling today! But such is war. I only hope we have learned some lessons from it. Some of my mother’s distant family was living in England, at the time of the air raids, and they lost touch with them after that………. The scary prospect is the ruthless and desperate nature of some entities and the immense fire power at their disposal. Why is it we blindly allow money, resources and brain power to be spent on developing even more powerful and devastating weaponry???? Why is there a market for those tools of death? I agree with all you’ve said at the end here. War is mindless and horrific when it happens, yet still we continue to stockpile weapons. I suppose each country is afraid that, if they don’t, and war is declared on them, they’d be in a hopeless position. As you say, the vast amounts of money and skill wasted on weapons could be put to such good use to help the world to prosper. There are so many people in the world in desperate need of basic things -like food! – just to survive. And we make bombs that could wipe out the Earth. Mindless. I didn’t know all that about Australia in the war. That’s really interesting – and the idea of giving the northern half of Australia to the Japanese is definitely mind blogging! Thank goodness that never happened! If only we were in charge, Millie!!! Yes but there can be squabbles amongst females too. Just look at the schoolyard!! Then we’d have to be selective! Seriously though, I know you’re right – but I don’t know the answer to world peace. Most nations keep making weapons as a deterrent. They daren’t stop making them in case some other country declares war and they can’t retaliate. But with nuclear weapons, if they were attacked, they might just have time to press the necessary button then it’s all over for everyone. The problem lies in getting total, world nuclear disarmament, which isn’t going to happen. Even if it did, there’s the question of trust. Would each country trust others not to continue making weapons in secret? I would like to think that by some miracle it didn’t explode. 🙂 Thanks for doing such a detailed post for us Millie. I really enjoyed reading this. The limestone gives it a faint yellowish ting to the building and certainly looks marvelous. What a beautiful church it is and I especially love the sophisticated details it has! I’m glad they allow you to take pictures of how the church looks inside. When I was visiting Porto, some of the churches looked really stunning but photos were not allowed inside. It’s an incredible building and the story of the bomb is quite amazing. We’ve been to Mosta before, Khloe, in 2003, so we knew what to expect, but you always take in more detail second time around. And yes, It’s great that they allow photos. The only rule of entry they have there is that women cover their bare shoulders. (I knew this from last time, so I went prepared!) They hand out cotton stoles/shawls to any woman who needs one.